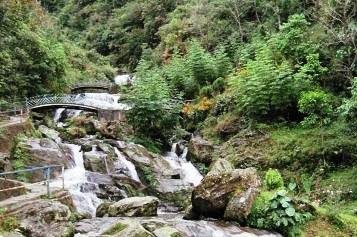 Neglected since 2009 when cyclone Aila struck and devastated the area, the Rock Garden and Gangamaya Park in Darjeeling, two popular spots for tourists coming to the Hills, are all set to get a make-over with the initiative of the Gorkhaland Territorial Administration (GTA). The Rock Garden located 9 km away from the Darjeeling town and Gangamaya Park another two km down were set-up in 1996 and 1997, respectively, under the supervision of Subash Ghisingh, then chairman of the now defunct Darjeeling Gorkha Hill Council (DGHC). Of all the spots in Darjeeling, the two destinations used to be the centres of attraction among the tourists visiting the hills, with boating facility, manicured garden, natural rivulets, variety of flowers and eateries. The approach meandered through lush green tea bushes and the Barbetey Khola (stream). In 2009 cyclone Aila struck and destroyed Rock Garden and Gangamaya Park. Because of the subsequent political unrest because of the statehood demand, the spots were not repaired or renovated by the DGHC, because of which tourist flow dwindled. On Friday, GTA chief executive Bimal Gurung visited the two spots and announced the decision to renovate Rock Garden and Gangamaya Park. “The two spots have not been re-developed since it was destroyed in 2009. Now that the GTA is there, we will renovate Rock garden and Gangamaya Park which are our assets into model tourist destinations. The project will cost Rs.17 crore,” he said. GTA has plans also to start a 20 km tourist circuit comprising Batasia, Rock garden, Gangamaya Park and Sidrapong. Batasia is above Rock garden, while Sidrapong, supposedly Asia’s oldest hydel project is 8 km below Gangamaya Park. “We want tourists to spend a whole day in the area. For this we have plans for a tourist circuit. A ropeway will be built from Batasia to Rock garden at a cost of Rs.8.5 crore which will cover 1250 meters. This aside we will spend another Rs.8 crore to develop road and infrastructure from Gangamaya Park to Sidrapong,” said Gurung. GTA will construct eight new home stay cottages in Gangamaya Park for tourists to spend the night along with fishing facility, rest rooms and proper parking space for vehicles. The Rock Garden area belongs to the Forest Department, however, and a hurdle is round the corner as, while laying it on 1.7 hectares, the DGHC had not taken a no-objection certificate from the Forest Department. Rock Garden, Gangamaya Park in Darjeeling to get renovation, GTA is there, we will renovate Rock garden and Gangamaya Park which are our assets into model tourist destinations. The project will cost Rs.17 crore,” he said.